For the last 14 years or so, I have been working on a book and, latterly, an exhibition – opening at the Wallace Collection this month – on the 18th-century British artist Sir Joshua Reynolds (1723–92). Though I am now looking forward to working on other artists and other kinds of art, I have been privileged to have had the chance to live with Reynolds’ work for such a long time. For, in his case, as I was rightly once told by the art historian David Mannings, familiarity breeds not contempt but ever-increasing respect. The longer I have studied Reynolds’ pictures, the more I have been struck by their complexity and ambition. An added thrill, of course, has been when I have stumbled across something – a sketch, a diary entry, an exhibition catalogue or piece of criticism – that, in a flash, casts new light on the artist’s paintings. One such moment occurred three years ago, in the tranquil environment of the library at the Yale Center for British Art. There, one morning, I settled down with my laptop to begin a day’s research on the Center’s celebrated Reynolds portrait Mrs. Abington as Miss Prue (1771). This painting depicts the most famous comic actress of late 18th-century England, Frances Abington, playing a role from William Congreve’s 1695 comedy Love for Love. It has always been appreciated as one of the artist’s boldest pictures. 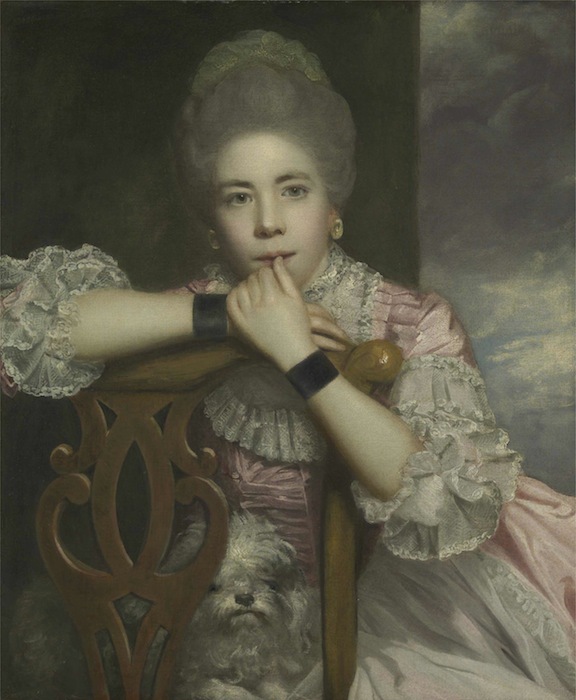 Since the middle of the 19th century, it has also been identified as the portrait of the actress that we know Reynolds submitted to the Royal Academy’s 1771 summer exhibition, thanks to a solitary reference by a visitor to the exhibition that described it as showing ‘Mrs Abington, actress, easy and very like’. I thought I’d see whether the picture had attracted any hitherto unnoticed press reviews when it went on display. I typed ‘Abington’ into the search engine of the online Burney Collection of 18th-century newspapers, specifying that it rove across all newspapers published in spring and summer 1771. Within minutes, I discovered a poem entitled ‘The Bagatelle’ that was published in a London newspaper called Public Advertiser on June 11, 1771. Strikingly, the poem’s narrator takes as his starting point his encounter with Reynolds’ picture of Abington in the Royal Academy exhibition room. Even more fascinatingly, he then offers a fictional, gently satirical account of the picture’s production in the artist’s studio. Such discoveries, of course, are gold dust to art historians. As I read the poem, however, I realised that the exhibition picture being described in the poem bore no resemblance to the Yale portrait whatsoever. The encountered portrait is described as rather reserved in character and as showing Abington wrapped in a cloak that is fastened ‘close about the Neck’ and that hides her ‘elegant’ form from view. Furthermore, the picture is described as showing the actress as herself, rather than in any of her theatrical roles. Puzzled, even astonished, I turned to the Center’s online catalogue of prints and found that Reynolds had indeed painted such a portrait of Abington in the early 1770s, a mezzotint after which was published in 1772. It didn’t take much longer to work things out. It was the painted original of this second portrait, surely, that the artist sent to the Academy display in 1771, and that – as was customary for his exhibition pictures of celebrities – was speedily engraved. Contrary to all our old assumptions, it seems likely that the famous Yale portrait, which was engraved only in 1822, was never publicly exhibited during the artist’s lifetime. This, in turn, opens up a fresh way of understanding Abington’s bold outward look in the Yale Center’s picture, and the provocative brush of her thumb against her lips. Her portrait as Miss Prue, rather than being geared to throngs of exhibition visitors, now seems more likely to have been a picture that was intended to be appreciated in private, by an admirer perhaps, or even by a lover. However, if such were Reynolds’ or his patrons’ intentions in the 1770s, I’m afraid that the display at the Wallace Collection will see them being flouted unashamedly. Mrs. Abington as Miss Prue will be one of the highlights of ‘Joshua Reynolds: Experiments in Paint’. I look forward to watching Reynolds’ portrait exert its power over new audiences and new admirers, even as I wish it a kind of goodbye.